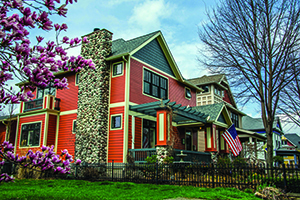 Timed entry tours begin at 6 p.m.
Tickets have gone on sale for the May 12 walking tour of Herron-Morton, hosted by Indiana Landmarks in conjunction with the Herron-Morton Place Association and Historic Urban Neighborhoods of Indianapolis. It will be a 90 minute tour involving a one-to-one-and-a-half-mile walk, led by current and former neighborhood residents. The tour will tell the history of Herron-Morton Place, with a focus on preservation efforts and revitalization. It will end with a “behind the scenes” tour of Herron High School, the original home of the Indianapolis Museum of Art and the Herron School of Art & Design. There will be four tours throughout the evening, so you can buy a ticket for 6 p.m., 6:15 p.m., 6:30 p.m., or 6:45 p.m. Each tour costs $10 per person ($8 for an Indiana Landmarks member or resident of Herron-Morton), and reservations are required. You can register online at here or by calling 317-639-4534. Spread the word to friends, family and co-workers, or buy a ticket for yourself and join us to learn more about our wonderful neighborhood!